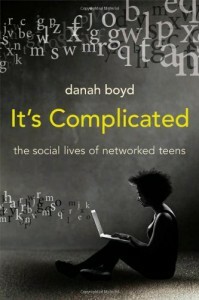 I recently finished reading danah boyd’s1 excellent, It’s Complicated: The Social Lives of Networked Teens (non-affiliate link). boyd spent over a decade traveling around the United States interviewing teens about their use of social media and has combined these interviews with a lot of research into this amazing, wonderful, and enlightening book. The central message is exactly what I have been feeling and starting to express here: that the vast majority of the evils and ills of social media are vastly overblown by the media and by parents who are largely ignorant of what is really going on. identity: why do teens seem strange online? privacy: why do youth share so publicly? addiction: what makes teens obsessed with social media? danger: are sexual predators lurking everywhere? bullying: is social media amplifying meanness and cruelty? inequality: can social media resolve social divisions? literacy: are today’s youth digital natives? In each she uses a mixture of quotes from her interviews with teens, findings from research performed by her and others in this area, and then her own analysis. Her anecdotes are insightful, sometimes moving, and always interesting. And I was pleased to find that my own thoughts on these matters were validated by her research. The central message of the book is, essentially, chill out. Every new technology brings with it a certain level of hysteria over how it is going to destroy the world, or at least lives, or eyesight, or any number of other fears. boyd points out how novels were seen as a dangerous thing for women in the 1800s, and TVwas dangerous in the 1950’s (and my other examples besides). Fear of new technologies, especially ones that the older generation does not understand, leads to a mass hysteria of how horrible and evil it is. The chapter on addiction really got my brain spinning. I’m thinking back to the parent who raised those panicky issues at that meeting at my son’s school a few weeks ago (as referenced in “Fear and Panic vs. Education and Common Sense”). As I mentioned, he spoke out about his great fear of social media addiction. He was very effusive about it and clearly very concerned. I refuted some of that line of thinking in that article but this particular chapter in boyd’s book coalesced my thinking even more. We’ve since relaxed, a lot. My son spent much of his 7th grade year hanging out after school with his friends. Part of this hanging out was to actually leave campus and go over to the main drag in that part of town city where the local college students tend to hang out. It has a fun mix of eclectic, trendy, and the usual assortment of chain stores. Their big thing was to go into CVS, buy milk, and then go back to school to hang out. This year, school has enacted a 3:45 rule that no one is allowed on campus after that time except for approved activities. Now he comes home early and only sees his friends on weekends, when schedules permit. What does this leave him and the vast numbers of teens in the same situation? Social media. When a parent says that their kid is always online and being completely anti-social, they are completely missing the point. Their teens are being completely social. They are using the tools at hand to make up for what has been taken away from them from what they need as growing, developing adolescents. boyd points out that in those rare cases where teens really do show the signs of actual addiction, you have to ask what is the underlying cause? It’s not the technology. Take it away, and it will be something else. boyd’s book is a healthy, and much needed, dose of common sense and it should be required reading for all parents of teens. Parents need to be informed about their kids social needs and about how the technology works. They also need to relax and stop locking their kids up inside in a misguided attempt to keep them safe. And they need to learn the difference between a new way of socializing and having friends and when someone is really in trouble. Then they can make informed decisions and we can all stop the knee-jerk reactions that aren’t helping anyone. This is a site about parenting, teens, social media, leadership, being online, and other topics that fall into those buckets or at least near them. The idea is to help us understand our modern world, how it is changing what it means to be a kid, a parent, a leader, a citizen, and a human being; to help us navigate these waters. Navigating the Waters by Andy J. Williams Affleck is licensed under a Creative Commons Attribution-NonCommercial-ShareAlike 4.0 International License.